BROOKLYN, N.Y., May 3, 2018 /PRNewswire-iReach/ — CronArtUSA and Go Doc Go announce the official launch of «The Box,» a functional public art installation at the Old Stone House in Park Slope, Brooklyn from 12-5pm on May 12th. This one day event provides a safe place where participants ages 30 to 65 can privately self-collect a sample to be screened for the HPV virus, the leading cause of cervical cancer. A revolutionary intersection of art and medicine, «The Box» is a socially-conscious, collaborative, public art installation created by Artist Ryan Cronin of CronArtUSA, alongside Go Doc Go Founder Maggie Carpenter, MD. «The Box» enables participants to circumvent the traditional Pap smear used to screen for cervical cancer. 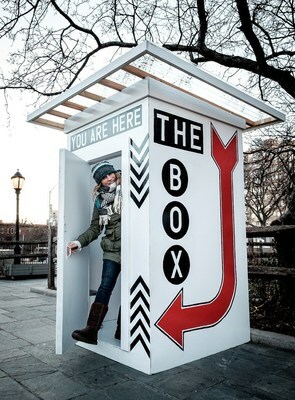 Part self-collection space, part art space, «The Box» is a privacy booth installed in a public location that gives women a safe place to independently swab a sample to be tested for the HPV virus, the leading cause of cervical cancer. «The Box» bypasses traditional medical routes: No exam is necessary. Early detection is instrumental in preventing the development of cervical cancer. «The Box» had beta installations at the O+ Festival in Kingston, NY and the Old Stone House in Park Slope, Brooklyn. Though too early in the sampling process to provide conclusive data, at both installations CronArtUSA and Go Doc Go found that 1 in 8 women who self-swabbed in «The Box» tested positive for HPV. It was this early detection that allowed for referral and further evaluation. «The Box» is scheduled to be installed throughout the Hudson Valley and Brooklyn from May through October 2018 including May 12th at the Old Stone House in Park Slope, Brooklyn, May 16th in Newburgh, NY at Safe Harbors Green, June 23rd at the East Flatbush Health Fair, September 23rd at the Flatbush Frolic in Brooklyn, NY, and in Kingston NY, on Columbus Day Weekend at the O+ Festival. «It’s exciting to see women walk into ‘The Box» for testing and watch their faces when they walk out because they realize how easy and painless it actually is to self-swab and take their healthcare into their own hands,» she adds. By removing the need for a doctor to perform the exam, «The Box» places the power of examination and self-care into the hands of the patient, pushing boundaries for how the US approaches healthcare. «I built and painted «The Box» not solely as an art object. What interests me more is how the audience interacts with the space, how they respond to the experience, and what they take away from having participated,» Cronin explains. To see a video on «The Box,» click here. As a painter, sculptor, muralist and product designer, Ryan Cronin reconfigures the world through art by appropriating text and figures from his surroundings. With a history in guerrilla art practices, Cronin’s work provokes discussion and tackles social issues, while bringing a sense of play into the viewer’s day. He exhibits his work on the streets, off bridges, in galleries, museums, and art fairs throughout the United States. In 2015, supported by his fans and followers, he established his flagship store and gallery in the Hudson Valley, NY. The gallery features his paintings, sculptures, and prints, along with an exclusive line of apparel and lifestyle goods based upon his original work. In 2017 he launched his online store CronArtUSA.com that keeps him connected with his growing, international fan base. In May 2018 he opened his second location in Westport, CT. Please join us and Be A Part Of The Art by visiting our galleries or cronartusa.com.